INTRODUCTION: Hypertension is on a high with preponderance of undiagnosed and untreated at-risk individuals. Pulse wave analysis (PWA) provides noninvasive assessment of arterial stiffness and central hemodynamic parameters. It provides more discrete and direct inference about cardiovascular aging that is expected to be exaggerated with systemic hypertension. MATERIALS AND METHODS: A case–control study was conducted in 116 newly diagnosed, never treated, apparently healthy hypertensives and 116 matched nonhypertensive controls. Oscillometric PWA was accomplished by Mobil-o-Graph (IEM, Germany) to derive cardiovascular parameters that were further analyzed. P < 0.05 was considered statistically significant. 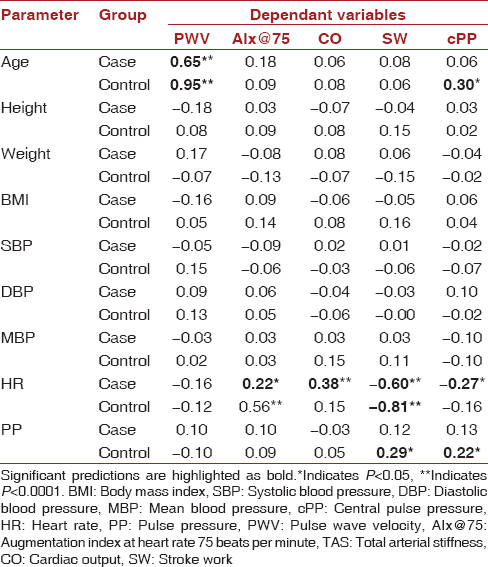 RESULTS: Cases showed significantly higher brachial arterial parameters (blood pressure [BP], heart rate, and rate pressure product); arterial stiffness (augmentation pressure, augmentation index, pulse wave velocity, total arterial stiffness, and pulse pressure amplification); and central hemodynamics (central BP, cardiac output, and stroke work) than age-, gender-, and height-matched controls. Major study parameters correlated with BP, heart rate, and age, but in multiple regressions, they were independent of most of these parameters. CONCLUSIONS: Oscillometric PWA is feasible in our population. It revealed beyond brachial BP abnormal profile suggestive of early cardiovascular aging in new and never treated hypertensives. It also suggests further work to consolidate and explore these results. About 33% urban Indians are hypertensive, and of these, 42% are aware; 38% are being treated, and one-fifth have blood pressure (BP) under control. Hypertension is the major cause cardiovascular morbidity and mortality and known to inflict at a younger age. Brachial BP (BBP) is a routine test for screening hypertension, but it is an indirect measure unlike parameters of aortic vasculature and heart which are more discrete in this regard. is not the only determinant of cardiovascular risk. Normalization of BBP does not directly infer about the status of root cause of hypertension that is loss of aortic compliance and accelerated hemodynamics. In this case, there is a need of a BBP independent tool that infers about central hemodynamics and arterial stiffness. Pulse wave analysis (PWA) provides such an opportunity to measure these parameters noninvasively and objectively. The invention of oscillometric BP cuff-based devices like Mobil-o-graph and generalized transfer factor has now allowed measurement of aortic and central hemodynamic parameters which are validated against intraoperatively, invasively measured results., It is of potential use in hypertensives. Normalization of BP is of value and such studies are available. However, true picture of effects of uncontrolled BP can be studied in newly diagnosed and never treated hypertensives that makes big submerged iceberg of hypertension in India. Studying discrete PWA parameters and various correlated for them in such subjects was the aim of our study. We conducted a case–control study on general outdoor patients of a tertiary care teaching government hospital attached to a government medical college under the collaboration of Physiology and Medicine departments from June 18, 2015, to March 2, 2018. Our study protocol was approved by Institutional Review Board of our Institute. We included apparently healthy nonathletic individuals, aged 15–65 years, both males and females, nonsmoking, nonalcoholic, not known for any acute or chronic systemic disease, not taking any medical treatment, ready to give written consent. We excluded individuals aged more than 65 years or <15 years, with any acute or chronic cardiovascular diseases, denying written consent, having any disease or drug history, current or ex-smokers or tobacco chewers, trained athletes, subjects using of any alternative system of medicines/lifestyle management such as yoga and meditation. The sample size was calculated by Raosoft software (Raosoft, Inc., free online software, Seattle, WA, USA). To have 95% confidence level, 5% precision, considering response distribution 50%, a sample size of 1345 was adequate for population of 6 lakhs of the city. We screened 1345 apparently healthy individuals from general outpatient departments and diagnosed 131 cases of hypertension. Out of these 131 cases, we excluded 11 due to history of irregular treatment, 9 due to use of lifestyle modification, 3 due to irregular pulse wave recording, 1 due to morbid obesity, and 2 due to arm circumference beyond available cuff size. Of remaining 1207 nonhypertensives, we selected 116 individuals matched to cases head-to-head by age and gender to make a control group. All individuals were interviewed personally for general features, demographic characteristics, and relevant history. Systolic BP (SBP) ≥140 mmHg and diastolic BP (DBP) ≥90 mmHg or use of anti-hypertensive medication was defined as hypertension. We used portable, personal computer attached calibrated and validated instrument Mobil-o-Graph (IEM Gmbh, Stolberg, Germany) of physiology department which records brachial pulse wave., It undergoes oscillometric PWA as per protocol designed by ESH. Brachial arterial pulsation generates the pressure oscillations which are transmitted to BBP cuff which is measured by transducer and fed into microprocessor. Computerized software records pulse wave from brachial artery and derives central aortic pulse wave by validated a generalized transfer factor. It further undergoes point-based and area-based analysis by computer software to derive various cardiovascular parameters. A BP cuff of appropriate size was chosen based on measured mid-arm circumference and applied to the left arm using standard protocol. All readings were taken after 10 min of rest, in postabsorptive phase with subjects avoiding smoking or alcohol for 12 h before the test, in a calm room avoiding external influences or arm movement. 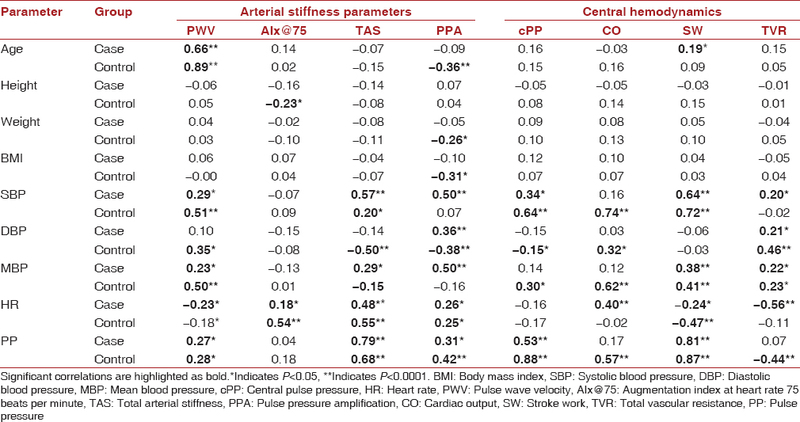 Arterial stiffness-augmentation pressure (AP), augmentation index at HR 75 per min (AIx@75), reflection magnitude percentage (Ref %), pulse wave velocity (PWV). Total arterial stiffness (TAS)- pulse pressure/SV. The data were transferred into an Excel spreadsheet and all descriptive analysis was expressed as mean ± standard deviation until indicated specifically. All calculations were done on GraphPad InStat 3 software (demo version free software of GraphPad Software, Inc., California, USA) and MedCalc Statistical Software version 16.4.3 (MedCalc Software bvba, Ostend, Belgium; www.medcalc.org; 2018). We calculated the statistical significance of the difference of various numerical parameters between case and control groups by Mann–Whitney test or unpaired Student's t-test. Spearman's correlation test was applied for correlation between parameters–parametric or nonparametric. Multiple linear regressions were done to find major and significant predictor parameters of major study outcomes. The statistical significance level was accepted as P < 0.05. Case group (n = 116) and control group (n = 116) had comparable mean age, height, and gender distribution. Cases had significantly higher weight, BMI, HR, BBPs, and RPPs. All vascular stiffness and central hemodynamic parameters were higher in case than control with evident statistical significance for all except reflection magnitude, pulse pressure amplification, and peripheral resistance. With cPP cutoff 40 and aortic PWV (aPWV) cutoff 10, cases had odds risk of 2.71, 6.27 respectively than controls with significance only for cPP [Table 1]. We studied the correlation between our major PWA parameters and independent parameters such as age, anthropometric parameters, and BP. Age and anthropometric parameters showed small and insignificant correlation in majority. While BBP parameters and HR correlated more consistently and significantly with study parameters [Table 2]. By multiple linear regression models, we tested predictors of PWA parameters (dependent parameters) from independent parameters, namely age, BMI, and SBP. Major predictor for PWV was age; for AIx@75 and CO was HR; and for SW and cPP were HR and brachial pulse pressure [Table 3]. This is, by our knowledge, the first study using Mobil-o-graph in newly diagnosed, never treated young to middle-aged urban Indian hypertensives. PWA, using generalized transfer factor, derives parameters of cardiovascular health beyond routine BBP. We compared hypertensive cases with age- and gender-matched controls. Cases, being undiagnosed and untreated, gave a chance to document the effect of raised BP on PWA derived parameters which are studied scarcely otherwise. Cases had higher BBP, HR, and RPP as compared to controls. This accelerated profile indicates the increase in workload on the heart; both frequency and pressure being the cause. This can produce adverse effect on heart as well as other organs downstream. Undetected elevated BP can explain the high prevalence of complications of hypertension such as stroke, renal failure, and myocardial infarction. However, BBP does not reflect the true after load that is present upstream in aorta. Such aortic parameters are derived by PWA. In cases, as compared to control, we found significantly higher (1) AP (increased central pulse pressure due to wave reflection from periphery); (2) augmentation index at HR 75-AIx@75 (measure of peripheral arterial stiffness, percentage of pulse pressure due to amplification by reflected wave); (3) aPWV (measure of central or aortic stiffness, inversely related to compliance and elasticity) (4) TAS (ratio of pulse pressure to SV). Hence, all types of arterial stiffness parameters are increased, and this extra after load has abnormal effect of cardiac functioning. These changes can be explained by reduced elastin and increased collagen in vessel wall. This process is normal during cardiovascular aging but in vascular progeria, it is accelerated, and premature aging produces loss of aortic compliance and increased stiffness. Aortic stiffness is more direct and stable parameter than BBP which is recorded from muscular artery, far from the ventricle. PWV has an incremental value in the determination of impaired coronary microcirculation in hypertensive patients. Triantafyllidi et al. reported the association of target organ damage with arterial stiffness indexes in untreated hypertensive patients and this explains the importance of screening for arterial stiffness in all newly diagnosed hypertensives. Even after diagnosis, effective treatment must reduce this stiffness to normal, and it has prognostic importance. Cases had accelerated central hemodynamics as compared to controls with statistical significance. Hypertensives had increased (1) aortic (central) BP; (2) CO; and (3) SW (dependent on SBP and SV). Brachial hemodynamics do not reflect the changes in the vicinity of ventricle of heart. In younger individual, cBP is superior to BBP. It is because elastic aorta gives a true effect than muscular brachial artery. This is more so with the fact that aortic SBP is lesser than routinely measured brachial SBP and we found the same in both groups (mean values: case group 137.5 vs. 149.4 and control group 115.2 vs. 124.6). Schillaci et al. found that in untreated hypertension, the metabolic syndrome was independently associated with a higher aortic, but not upper limb, PWV. Gedikli et al. reported that arterial stiffness was associated with serum heart-type fatty acid-binding protein levels, a sensitive marker of myocardial damage, in patients with newly diagnosed HT. These studies support the importance of aortic PWV. Accelerated central hemodynamics lead to extra workload on heart as well as harm to the organs with high capillarity such as heart, brain, and kidney. These parameters are known to be affected differentially by various anti-hypertensive used, and the same can be studied in our population too. PWA parameters correlated with age (only for PWV), anthropometric measurements (insignificantly in most results), HR and BBP (not all parameters and not for all types of BBPs) in line with our previous studies done in (1) young first-degree relatives of type 2 diabetics (age 22 ± 6 years), (2) young first-degree relatives of hypertensives (age 21 ± 5 years), (3) normotensive individuals (age 15–65) years., However, on multiple regressions, they were not the significant predictors of PWA parameters like previous studies with some differences. It suggests that in various conditions, in presence with familial risk of vascular progeria, in normal individuals and untreated hypertensives and perhaps, treated hypertensives; the relationship between PWA parameters and these independent parameters vary and understanding of same can better clarify their significances.,,, Pulse pressure and HR were the main predictors but not for all parameters and not in all study groups, partly in line with previous studies in normal individuals.,,, This suggests that PWA parameters infer to cardiovascular status much independent from peripheral BP and use of the same can help to study the cardiovascular health status better. Pulse pressure amplification (ratio of brachial to aortic pulse pressure), reflection magnitude (percentage of wave reflection from periphery), and peripheral resistance were the only three parameters that were significantly not different between cases and controls. These three parameters are determined by peripheral arteries and arterioles while the cBP and stiffness parameters are determined by the aortic properties. This indicates superiority of studying aortic parameters than brachial parameters even in undiagnosed, untreated hypertensives. Hypertension runs in family and is very familiar disease in India. Looking at the magnitude and severity, it must be offered detailed assessment, whenever feasible. There is always a need of BP independent cardiovascular parameter. PWA provides a broad spectrum of such parameters, that too, with objectivity, cost-effectiveness, reproducibility, validity, and noninvasive measurement. The oscillometric PWA does not require any expertise or training for the users. It allows simultaneous measurement of brachial, central, and stiffness parameters. It can be used on wide scale for screening and therapeutic monitoring even at primary health-care level by family physicians. Cost and availability are limiting factors, but with time it will be used optimally. Hypertension needs assessment beyond simple BBP like HR variability, ankle brachial index, QT interval as we published previously.,, Moreover, we can add PWA in the same category as a potential tool. Our study was a baseline study, and further work is suggested in this direction. There were few limitations of our study like cross-sectional nature, moderate sample size, lack of follow–up, and absence of biochemical parameters which we intend to rectify in our future studies. The use of novel instrument Mobil-o-graph can be considered more a strength than a limitation of the study. PWA revealed adverse profile of arterial stiffness and central hemodynamics in newly diagnosed, never treated hypertensives that was not totally dependent on BBP. These direct and discrete parameters suggest early cardiovascular aging and should be studied further for confirmation and consolidation. We are thankful to the Physiology department of our medical college and Sir T Hospital Bhavnagar for giving the facilities available in the department and to volunteers for participation in this study. The present study is a part of the research work of JDS for PhD degree under M K Bhavnagar University, Gujarat, India. O'Rourke MF, Safar ME, Dzau V. The cardiovascular continuum extended: Aging effects on the aorta and microvasculature. Vasc Med 2010;15:461-8. White WB. Heart rate and the rate-pressure product as determinants of cardiovascular risk in patients with hypertension. Am J Hypertens 1999;12:50S-5S. de Simone G, Devereux RB, Kimball TR, Mureddu GF, Roman MJ, Contaldo F, et al. Interaction between body size and cardiac workload: Influence on left ventricular mass during body growth and adulthood. Hypertension 1998;31:1077-82.
de Simone G, Roman MJ, Daniels SR, Mureddu G, Kimball TR, Greco R, et al. Age-related changes in total arterial capacitance from birth to maturity in a normotensive population. Hypertension 1997;29:1213-7. Lackland DT, Weber MA. Global burden of cardiovascular disease and stroke: Hypertension at the core. Can J Cardiol 2015;31:569-71. Roman MJ, Devereux RB, Kizer JR, Lee ET, Galloway JM, Ali T, et al. Central pressure more strongly relates to vascular disease and outcome than does brachial pressure: The strong heart study. Hypertension 2007;50:197-203. Tsamis A, Krawiec JT, Vorp DA. Elastin and collagen fibre microstructure of the human aorta in ageing and disease: A review. J R Soc Interface 2013;10:20121004. Kaess BM, Rong J, Larson MG, Hamburg NM, Vita JA, Levy D, et al. Aortic stiffness, blood pressure progression, and incident hypertension. JAMA 2012;308:875-81. Ikonomidis I, Lekakis J, Papadopoulos C, Triantafyllidi H, Paraskevaidis I, Georgoula G, et al. Incremental value of pulse wave velocity in the determination of coronary microcirculatory dysfunction in never-treated patients with essential hypertension. Am J Hypertens 2008;21:806-13. Triantafyllidi H, Tzortzis S, Lekakis J, Ikonomidis I, Arvaniti C, Trivilou P, et al. Association of target organ damage with three arterial stiffness indexes according to blood pressure dipping status in untreated hypertensive patients. Am J Hypertens 2010;23:1265-72. Mitchell GF, Hwang SJ, Vasan RS, Larson MG, Pencina MJ, Hamburg NM, et al. Arterial stiffness and cardiovascular events: The Framingham heart study. Circulation 2010;121:505-11. Saladini F, Santonastaso M, Mos L, Benetti E, Zanatta N, Maraglino G, et al. Isolated systolic hypertension of young-to-middle-age individuals implies a relatively low risk of developing hypertension needing treatment when central blood pressure is low. J Hypertens 2011;29:1311-9. Schillaci G, Pirro M, Vaudo G, Mannarino MR, Savarese G, Pucci G, et al. Metabolic syndrome is associated with aortic stiffness in untreated essential hypertension. Hypertension 2005;45:1078-82. Gedikli O, Ozturk S, Yilmaz H, Baykan M, Kiris A, Durmus I, et al. Relationship between arterial stiffness and myocardial damage in patients with newly diagnosed essential hypertension. Am J Hypertens 2008;21:989-93. Protogerou AD, Stergiou GS, Vlachopoulos C, Blacher J, Achimastos A. The effect of antihypertensive drugs on central blood pressure beyond peripheral blood pressure. Part II: Evidence for specific class-effects of antihypertensive drugs on pressure amplification. Curr Pharm Des 2009;15:272-89. Solanki JD, Mehta HB, Shah CJ. Pulse wave analysed cardiovascular parameters in young first degree relatives of type 2 diabetics – A cross-sectional study. Indian Heart J 2018;70:341-5. Solanki JD, Mehta HB, Shah CJ. Pulse wave analyzed cardiovascular parameters in young first degree relatives of hypertensives. J Res Med Sci 2018;23:72..
Solanki JD, Mehta HB, Shah CJ. Aortic pulse wave velocity and augmentation index@75 measured by oscillometric pulse wave analysis in Gujarati nonhypertensives. Vasc Investig Ther 2018; [Ahead of print]. Solanki JD, Mehta HB, Shah CJ. Aortic blood pressure and central haemodynamics measured by non-invasive pulse wave analysis in Gujarati normotensives. Int J Clin Exp Physiol [Ahead of print]. Farag YM, Mittal BV, Keithi-Reddy SR, Acharya VN, Almeida AF, Anil C, et al. Burden and predictors of hypertension in india: Results of SEEK (Screening and early evaluation of kidney disease) study. BMC Nephrol 2014;15:42. Solanki JD, Gadhavi BP, Makwana AH, Mehta HB, Shah CJ, Gokhale PA. QTc interval in young Gujarati hypertensives: Effect of disease, antihypertensive monotherapy, and coexisting risk factors. J Pharmacol Pharmacother 2016;7:165-70.